UPDATE: Here’s a photo of the turnout from Reinette Senum’s Facebook page. The crowd was estimated about about 250. 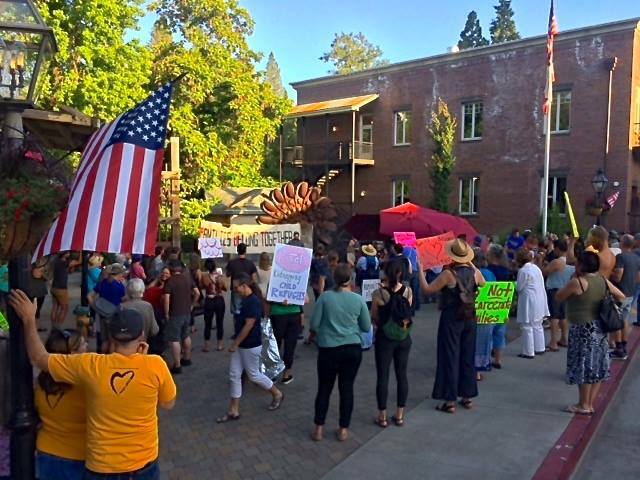 A Candlelight Vigil, “End the Border Brutality,” will be held this Thursday, June 28th, 7-9 p.m. in Robinson Plaza at the bottom of Commercial and Union Street in downtown Nevada City. Organizers will be holding the event in reaction to the escalating detention and separation of migrant Mexican and Latin American children and their parents now being held under criminal charges. Tearing children away from their parents — then caging them indefinitely and without due process — is a new moral low for America. Children being separated from their parents are facing long-term medical issues and lasting trauma and mental issues. Children advocates are concerned that infants and toddlers who can’t identify their own parents will be permanently separated. While detaining migrants crossing the border has been growing throughout different US Presidencies, it has been under President Trump’s most recent “Zero Tolerance” policy initiated in April that the separation of children and parents has more than doubled. Over 11,000 minors have been placed in “Unaccompanied Children’s Program” and being held in internment camps where elected officials have been turned away from entering. According to federal government data over 60 percent of people are held in for-profit privately run immigrant prisons. This Thursday’s Candlelight Vigil is intended to educate as well as announce an upcoming nationwide campaign. Bring your family, extra candles to share, banners and signs, love, and determination. I am sorry I am physically unable to attend but I will be with you in spirit.